Stayed for a week with family, I could not fault this hotel at all. Excellent food with lots of choice, very obliging bar staff and reception staff. They could not do enough for you. Very reasonable prices at the bar, with plenty of choices of drinks. We would stay again. My only complaint would be the staff in the restaurant. They were slow to clear tables in between courses and were quite rude at times. The outdoor pool was great and always plenty of spare sunbeds. just stayed here for a week full board. Lovely hotel good food very clean etc. Bar staff were the friendliest weve come across,other staff were ok but those in dining room seemed a little frosty. we stayed at this hotel for a week.it was absolutley spotless,the food was good, quite a selection of everything. the location is great, hotel staff very friendly. we went out on an evening so we never saw much of the entertainment.we would definatley return to this hotel. we stayed in this hotel for a week. it was absolutely great. would definately return.it was clean,good food, staff friendly and in an ideal location. Just back from this hotel and we really enjoyed ourselves. Good location, nice hotel, entertainment day and night for the kids, food was good - not the best selection but certainly not the worst either. I'm quite a fussy eater so some nights the choice was a bit limited for me and my son didn't like the food but that was down to our fussiness not the hotel's catering. All food was hot, well cooked and plentiful. BBQ on a Thursday is lovely. Good pool area with slide and plenty of sunbeds, never had to fight for a bed. The pool is supposed to open at 10am with a ban on reserving sunbeds although this wasn't enforced while we were there but wasn't an issue as we always got beds. Slide for the kids is a bonus and keeps them entertained! Hotel offers a free towel hire service also. Rooms are a decent size and cleaned everyday with towels changed daily if you wish. We had a room at the back which was great for us as we could catch the last rays of sunshine from our balcony! The only complaints we have about this hotel are the sunbeds and lifts. Sunbeds were a bit uncomfortable so we bought a mattress from the newsagents for 6 euro's each and the lifts took an age at feeding time. Not so bad if you're low down but this hotel has 15 floors - alright coming down but going up is a nightmare! 4 lifts in total could have done with a few more but other than that a good hotel in a good location. Hotel very clean. Rooms cleaned every day, public areas spotless. Dining room clean and tables cleared quickly. We enjoyed the food. Plenty of variety and all well cooked and presented. Thought hotel was ideally located - near the old town, and only about 5 minute walk from beach. Staff were always very pleasant and couldn't do enough for guests, in particular the bar staff. Would definately recommend this hotel and wouldn't hesitate to visit again. Just returned from a week at the Princesa. Very clean Hotel in a good location near the old town and within easy reach of beach, shops, bars etc. We were a party of 2 couples and our room was at the back looking onto mountains (and backstreets) whilst friends room was overlooking pool and distant views of the sea which was nicer and sunnier. Think there was a 'Party in the Park' a couple of streets away first night making it hard for us to sleep but rest of holiday it was much quieter. Food was ok most nights, there was always a salad selection which was a little repetative and a hot choice which was ok 5 out of the 7 nights. Plenty of fresh fruit. Reasonable breakfast Bacon, eggs,sausage etc but cereal was a bit limited. We didn't bother much with the entertainment as there was so much to choose from just a stones thrown away. A couple of the Restaurant staff were a bit frosty but generaly ok. Really enjoyable trip. Myself and my family stayed in hotel princesa for 10 days and we stayed full board.The food that was available at the hotel was of a wide variety and was absolutely delicious. The hotel and the hotels surroundings were very clean all throughout the day. The hotel is only a five minute walk to the beach. The hotel staff are friendly, polite and very helpful. The entertainment on a night was good as there was but entertainment for children as well as adults. I would definitely stay at this hotel again. Spotlessly clean,bedding and towels changed daily. Food excellent. Plenty of choice both english and spanish. Hotel 10 minute stroll to old town,5 minutes stroll to numerous bars and restaurants yet far enough away from them so as not to cause you to lose any sleep due to noise. The staff were fine with us and the cleaning staff were especially good. As regards to entertainment,forget it! However you are in Benidorm so there is plenty going on in the surrounding area. 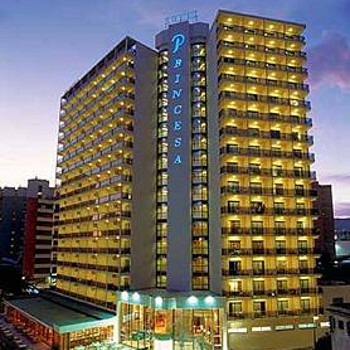 The Princesa is a superb hotel in a good central position. The place was maintained spotlessly clean in all areas, and the food was nothing short of excellent and believe me we are hardened travellers to all corners of the globe. I will go as far as to say that the breakfast in the Princesa was the best we have ever had anywhere. The Benidorm nightlife is not far away and there are a good selection of local bars with entertainment within a few 100 mts of the hotel. However a walk to the left towards Levante end would only take 10 -15 mins, whilst it would be around the same in the other direction to the old town. The staff were all polite and geared up to assist you at all times. We did not stay in the hotel after dinner and therefore did not take much notice of the entertainment, but there was always some thing on and the animacion team seemed to work hard at all times. We would definetley visit again, and commend this hotel to anyone thinking of visiting.